The answer to our health and weight woes is far more complex than willpower. There is a pervasive stigma that haunts the 70% of Americans who are overweight: that they are just lazy, unmotivated slobs who have no willpower. This couldn’t be further from the truth. All of the overweight people I’ve known are highly motivated, creative, smart, and successful people. They’ve graduated high school and/or college. They’ve landed good jobs, started businesses, they work hard, buy and maintain homes and cars, raise healthy and happy kids, and otherwise make their dreams come true. Why is it that these incredibly smart and successful people, who are very disciplined in other areas of life, struggle so much with weight, diet, and exercise? Because it’s not an issue of willpower, that’s why! Most of us believe that we are in control of our weight using our higher brain and thought processes. This is false. As this article clearly demonstrates, your weight is controlled by the impulses sent from the “lower primitive brain”, hormonal signals, and genetic predisposition…not by willpower! The urge to eat calorie-dense and delicious foods is NORMAL! Let’s start with the most important reason: We are biologically wired to eat. History informs biology. For almost the entire course of human history — roughly 6 million years — the biggest threat we faced was starvation. So it makes sense that those of our ancestors who had a high food drive and whose bodies stored fat easily were handsomely rewarded by being able to survive and reproduce, while those who stayed thin and weren’t as interested in seeking food would die. This is why our bodies and brains are highly sensitive to food shortage, and also why we seek highly palatable — tasty and calorie-dense — foods. Highly palatable foods trigger the reward centers in the brain, thus ensuring we continue to seek more. Of course, our ancestors only came across highly palatable foods — fruit and honey — very occasionally. And guess what they’d do? They would BINGE on those foods. Are you having an ‘A-HA!’ moment right now? That’s why it’s so hard to stop eating the ice cream! So it doesn’t help that modern humans have constant access to highly palatable food! Humans are wired to eat more and move less…but we are often told to do the opposite! Willpower will never trump 6 million years of human evolution! It’s not your fault! Moving on…Have you ever noticed that when you sleep poorly you feel extra hungry the next day? Poor sleep increases hunger hormones and decreases satiety hormones. This means you’ll feel compelled to eat more…and will be less satisfied by whatever you eat. Additionally a single night of poor sleep can cause you to become insulin resistant – near diabetic. This means you’ll store more of those excess calories as body fat! I bet you never knew sleep was so important for weight maintenance…but as you can clearly see, this has nothing to do with willpower! When you’ve had a long and stressful week at work, your bank account is low, bills are due, your husband is mad at you, and your kid had three meltdowns at school…what’s the first thing you think of come Friday night? If you’re anything like me, a bottle of wine, a large pizza, and a half-gallon of ice cream might be involved! Overeating or craving certain foods is a red flag! Our body is trying desperately to get our attention and let us know that something is wrong…that our needs are not being met. Stress triggers our need to experience pleasure and also causes elevated hunger hormones. Food causes us to experience pleasure, so it’s no wonder that people often use food for comfort when we aren’t finding pleasure in much else. We cannot control our need for pleasure or the hormones that our body releases as a result of stress…this isn’t a willpower issue. Certain populations including Eskimos, Samoans, Africans, and Hawaiians tend to be genetically heavier, even when eating a healthy, ancestrally-appropriate diet. No amount of willpower or dietary cajoling will turn the demigod Maui (in the movie Moana) into a wiry and super-lean triathlete. Once again, this is biologically determined and beyond our control. Ladies – have you ever noticed that you’re super hungry the week before your period? Or – ladies and gents – that you’re more hungry as the days get darker when autumn leads into winter? This is not your imagination! Like all other animals on this planet, our bodies are set on circadian rhythms that affect hormones, hunger, and feeding patterns. Circadian rhythms are ultimately determined by the sun…not willpower. Check out this blog post to learn more. Famine causes elevated hunger hormones and food-seeking behavior. What do most diets do: restrict calories. A diet is nothing more than a self-induced famine. And every time your body experiences a famine it gets better and faster about ramping up hunger hormones, decreasing energy so you move less, and becoming more efficient at fat storage. Check out this series of blog posts I wrote several months ago about how and why diets make us fatter. Adding nutrient-dense foods is just one way we can positively affect our biology…but it’s not the only way…and it shouldn’t take monumental willpower to eat well. If it’s not willpower, what is it? How do I lose weight? Anything that requires monumental amounts of effort or willpower is doomed to failure, so first rule of thumb is don’t go on a restrictive diet! A self-induced famine that doesn’t meet the basic human need for calories and pleasure won’t help you get your hormones or hunger under control…and may make things worse. 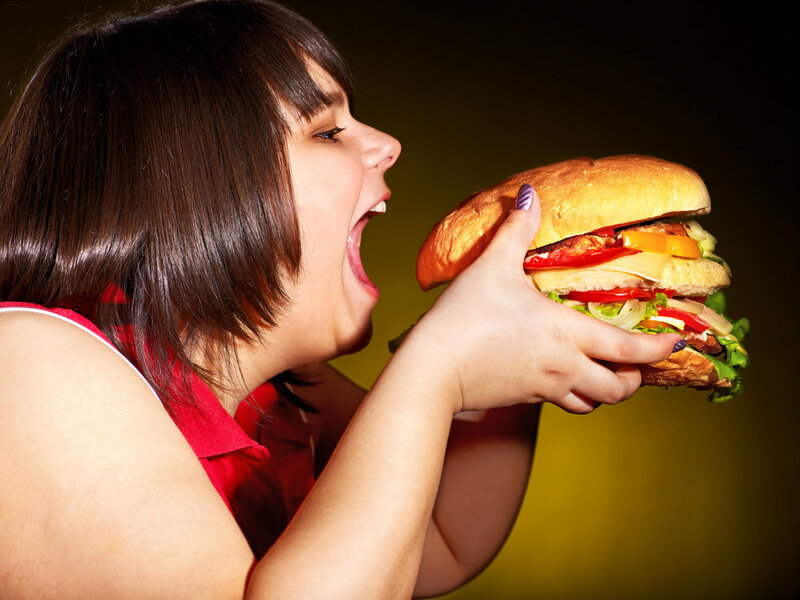 Food rules won’t fix your overeating problem! Eat slower. You’re not a shark. Humans are supposed to chew their food. Stop being a “yes-man”…that means learning to say ‘no’ to others. This is so tough for women because it brings on guilt. But in our constant rushing, we never have time for ourselves or even a second just to breathe. When a non-essential activity pops up and you’d rather curl up on the couch with a book, choose yourself every now and then! Learn to unplug for at least a short period of time every day. Some of us are answering emails on the toilet! Set boundaries on your time and when/how often people can reach you. Reduce your exposure to toxins. Check out this blog post I wrote on “obesogens” for simple tips on how to limit toxin exposure. Are you ready to change your health for good? I cover all of the above in detail, plus so much more, in UnCaged!, a powerful learning program like nothing you’ve ever tried before! Addressing all facets of health is the key to achieving happiness and a healthy and natural weight for your body. You have to work with your body instead of against it. And I can help you do it! Join us on this revolutionary journey! UnCaged is an interactive and members-only online Intuitive Eating course that will help you discover why you struggle with food, will change the way you eat, and will improve your self-image! Sign up today by filling out the form below or you can visit this page for more details on the course. Don't Diet in 2019 - Reason #10: Diets cause "failure syndrome"